This week, a group of Senators and I sent a letter to Betsy DeVos, President Donald Trump’s nominee for Secretary of Education. We raised concerns about her potential conflicts of interest that may not be resolved by her public ethics agreement — particularly potential conflicts in higher education. In our letter, we requested a response to a series of questions about our concerns before the Senate Health, Education, Labor and Pensions (HELP) Committee votes on her nomination. On January 19, 2017, you provided the Senate Committee on Health, Education, Labor, and Pensions (HELP) with your Office of Government Ethics (OGE) filing indicating the steps you have agreed to take in order to comply with federal conflicts of interest laws if you are confirmed by the Senate as Secretary of Education. We have carefully reviewed the information you provided, and we are concerned that, rather than allaying concerns, your ethics arrangement raises additional questions about your potential conflicts as Education Secretary. It appears that the Trump Administration will allow you and other Cabinet nominees to retain family trusts. This decision conflicts with decades of precedent set by previous Presidents for their cabinet members. In your case, the Trump Administration’s unusual departure from past ethics review practice is a particularly serious problem because, as The Washington Post has reported, you and your family will retain three different family trusts for which we have incomplete information about financial holdings and activities. 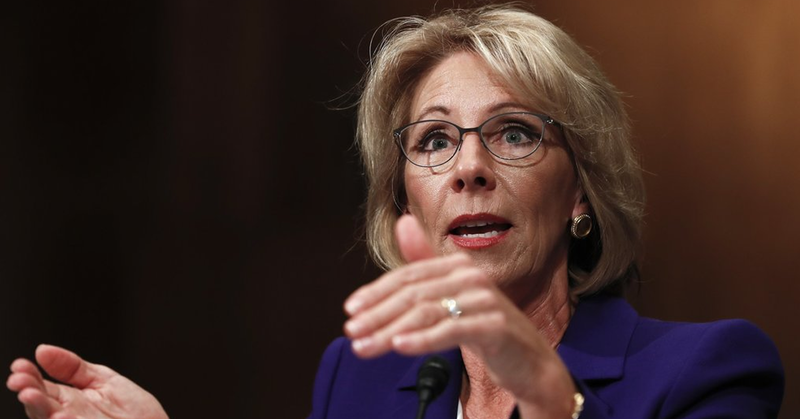 We are particularly troubled because new information revealed in your ethics agreement indicates that these family trusts and other investment vehicles have held and may continue to hold significant investments in higher education-related entities that could be directly affected by decisions you make as Secretary of Education. Your January 17, 2017 nomination hearing took place before your OGE ethics agreement was completed and provided to the HELP Committee, and Chairman Alexander gave members limited time — only five minutes each — to question you during your hearing. Although we have asked for a second hearing, Chairman Alexander has denied our request. We therefore write to understand more about your potential conflicts of interest, including investments in companies that have a financial stake in the federal student loan program, which you would oversee if confirmed as Secretary of Education. Compliance with the ethics agreement you have reached with OGE will ensure that your behavior with your financial holdings does not result in criminal conflicts of interest. But it does not appear to fully guarantee the elimination of all conflicts of interest that could influence your decisions as Secretary of Education. Minimum compliance with federal law does not guarantee to the Senate or to the public that your ethics agreement fully prevents conflicts of interest that could harm students and taxpayers. Your ethics review process has revealed dozens of financial interests that you and your family hold through a complicated network of investment entities, assets, and trusts. You have agreed to divest yourself of interests in more than 100 companies-some of which make money by collecting student loan debt, refinancing student loans, providing online learning platforms or education reference materials, or running for-profit educational institutions. We are concerned that if confirmed, you would continue to benefit from significant financial holdings in family trusts that may hold investments in companies affected by the Department of Education’s activities. You noted in your ethics disclosure letter that “I will retain my position as co-trustee of Family Trusts 2, 11, and 12. “ You have disclosed the assets in only one of these family trusts (Family Trust 2); you have not disclosed the underlying assets in the other two (Family Trusts 11 and 12). Members of the Senate-and the public-therefore do not know whether these trusts contain investments (like those contained in Family Trust 2) in companies related to higher education that could pose conflicts of interest or misalign your incentives as the Secretary of Education. Attachment A of your ethics arrangement lists assets from which you plan to divest. This list includes investments in Snow Phipps, AEA Investors, and Apollo Investment Corporation, each of which is affiliated with for-profit colleges that may be directly affected by the Department of Education’s implementation of the Gainful Employment regulations, ongoing litigation with recently terminated for-profit accreditor ACICS, as well as other for-profit college regulatory oversight at the Department of Education. You also noted in your ethics agreement that you will continue to hold financial interests in eight entities, including an investment worth millions in RDV Corporation. This investment vehicle appears to be connected to Performant Financial Corp. — a debt collector that is currently seeking a new contract with the Education Department after the Department declined to renew its previous contract last year. While you have agreed to divest from financial interests linked to Performant, we remain concerned by your continued financial interests in RDV Corporation, which appears to be connected to Performant through MCF CLO IV, LMF WF Portfolio II, LMF WF Portfolio III, and/or other funds managed by Madison Capital Funding. We are also concerned about your conflicts of interest related to other members of your family. Given your family’s significant holdings, it is easy to imagine that your decisions as Education Secretary could have a significant financial impact on other immediate family members not covered in your OGE agreement. For example, other immediate family members are, like you, Board members of the RDV Corporation, which is connected to Performant. Your agreement with OGE addresses many conflicts of interest issues. But you have disclosed financial connections to a debt collector and for-profit colleges that depend on the Department of Education for their revenue. Given the fact that you will continue to hold positions in family trusts that are not transparent in their holdings, we ask for additional information to allay concerns that both the investments you will soon divest of, and your family’s trusts that you will continue to hold, will not create conflicts for you as Secretary of Education. It is important not only that you comply with your ethics agreement, but that you answer HELP Committee members’ questions about additional concerns raised by the information contained in that agreement. Will you commit that neither you, nor your spouse, nor your children, nor your extended family beyond your spouse and children, will benefit financially from actions you take as Secretary through any of the Attachment C entities in which you plan to retain a financial interest, including Neurocore, LLC, Windquest Group, Inc, and RDV Corporation? What steps will you take to ensure that, on an ongoing basis, neither you nor any member of your family has a financial stake in a company that would benefit from the decisions you make at the Department of Education? You committed in your ethics agreement that you would not “participate personally and substantially in any particular matter that to my knowledge has a direct and predictable effect on the financial interests of any of these trusts or their holdings, unless I first obtain a written waiver.” Does this include matters that have a direct and predictable effect on the financial interests of members of your extended family, beyond your spouse and children? Will you recuse yourself from all matters pertaining to the Department of Education’s debt collectors, including Performant Financial Corp.? Will you recuse yourself from all matters pertaining to institutions of higher education in which you have previously had a direct or indirect investment through a private equity fund, hedge fund, or other investment vehicle, including institutions with past, current, or future affiliation with AEA Investors, Snow Phipps, and Apollo Investment Corporation? You shared your intention to “return to the family business” at the conclusion of your time as Secretary. Does this intention mean that you plan to benefit from entities that may be influenced by your decisions as Secretary of Education? If not, please explain this intention. Will you commit to ongoing disclosure of all investments held in the Family Trusts of which you intend to continue to serve as a Trustee? We would appreciate a response to our questions by Monday, January 30, 2017.